UPDATE: The LED Conversion Project is 90% complete. Dagle Electric will continue to wrap-up the project, working on miscellaneous punch-list items. DPW is asking all residents to please take a look around your neighborhood to see if there are any issues with the new streetlights. At the completion of this project, DPW will begin to further troubleshoot light issues with the Town's new maintenance provider. or dayburning, thank you! We have documented your request. If you are looking to have a streetlight dimmed due to brightness issues, we are working towards being able to make these changes for you. 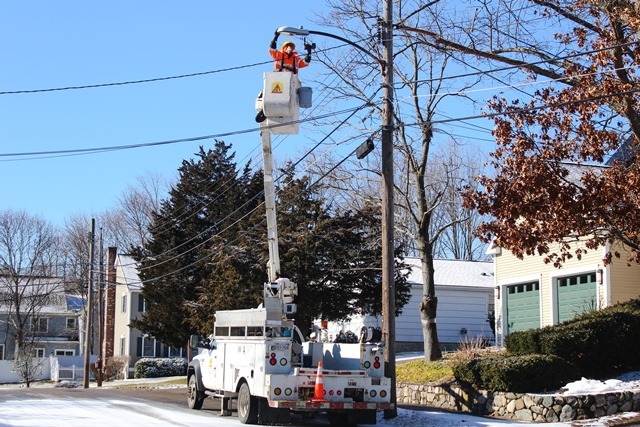 The Town is awaiting access to the new smart controls system, which will allow DPW to remotely dim streetlights and be notified of future outages. Please notify DPW of any streetlight issues via SeeClickFix or by phone at #781-455-7550. The Town of Needham is in the process of converting approximately 2500 streetlights in Town with LED fixtures with smart controls. The project will replace the existing high pressure sodium cobra head fixtures. The Town’s contractor, Dagle Electric will be working throughout Needham to complete the installation by the end of February 2019. LED lights use significantly less energy and are expected to last two times longer than high pressure sodium lights. The Town also anticipates a significant savings in energy and maintenance costs. The smart controls will allow the Town to remotely monitor system performance and identify light outages immediately. This project is partly funded by a grant through the Metropolitan Area Planning Council (MAPC) and funds appropriated from May 2018’s Town Meeting. Listed below are four vendors that are currently under contract with the Town to provide supplies and installation services for the LED conversion. In order for the Town to qualify for grant funding, two of these contracts were bid through the MAPC. Installation of LED Lights: (bid through MAPC) Dagle Electrical Construction Corp.